JOHANNESBURG, Jan 9 2018 (IPS) - Conditioned that ploughing is the sure way to produce crops, Zimbabwean farmer Handrixious Zvomarima surprised himself by trying a different method. He planted cowpea seeds directly without tilling the land. It worked. 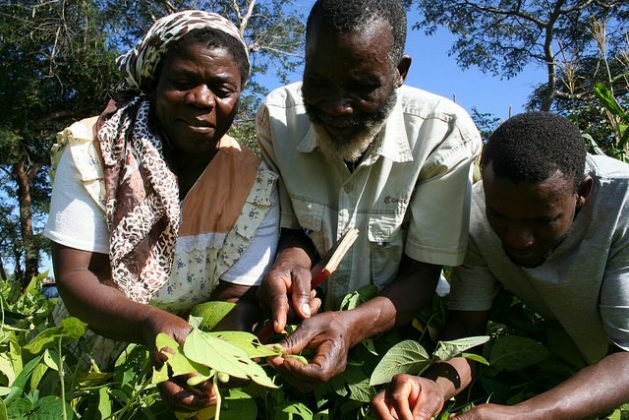 The new method tripled Zvomarima’s cowpea yield when many farmers did not harvest a crop following the El Nino-induced drought which affected more than 40 million people in Southern Africa. Some of the technologies that more farmers need include access to resilient seeds and livestock breeds, timely weather information and weather index insurance. Zvomarima from Shamva District, 120 km northwest of Harare, adopted the water-saving method known as ‘no till farming’. This is part of the Climate Smart Agriculture (CSA) practices and approaches developed and promoted by the United Nations Food and Agriculture Organization (FAO). This model of climate-smart agriculture seeks to sustainably increase productivity and incomes while helping farmers adapt to and become more resilient to the effects of climate change. CSA practices also aim to reduce and remove agriculture’s greenhouse gases emissions, where possible. “Policymakers have a role to play in climate-smart agro-technological innovation; the researchers suggest traditional supply-side measures and equivalent demand-side measures (such as tax breaks) could reduce cost and increase return on investment for users,” said Dr. Federica Matteoli, project Manager at FAO Climate Change and Environment Division in Rome. She shared a case study of Italy’s embrace of CSA at the 4th Global Science Conference on Climate Smart Agriculture in Johannesburg, South Africa in November 2017. Matteoli said policies need to be compatible with CSA objectives and their ability to boost the development and adoption of CSA technological innovation. Italy was currently at the forefront of promoting research and developing scientifically supported policies related to climate change adaptation and mitigation measures, Matteoli said. At the same time the country was promoting the application of the principles of CSA to locally building resilience throughout the food system. Matteoli said cooperation and knowledge sharing can promote an enabling policy environment at national and local level in promoting CSA. Italy has promoted conservation agriculture, no tillage practices, climate-smart production systems and knowledge transfer which have collectively been called the Italian Blue Agriculture. For an enabling environment to promote CSA, potential users must be engaged with earlier in the innovation process, ensuring sharing of information and linkage with universities, technical bodies and national institutions. In addition, there is need for appropriate education programmes and awareness campaigns and the identification of knowledge needs for CSA and priority areas for intervention using consultative and participatory approaches, Matteoli said. 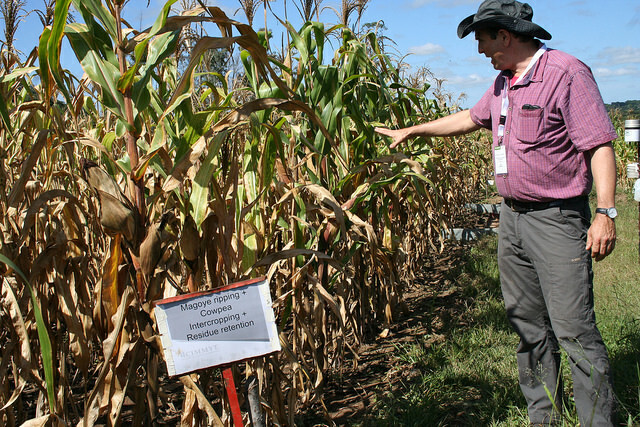 Researchers say CSA techniques are effective but there is urgency to quickly spread out the practices, innovations and technologies as climate change threaten agriculture productivity. Some of the technologies that more farmers need include access to resilient seeds and livestock breeds, timely weather information and weather index insurance. Scaling up CSA needs bold and inclusive policies which are still lacking several decades after CSA approaches were introduced. Researchers and development actors argue that alternative farming methods have been proven to help farmers cope with weather variability and still harvest crops even in poor rainfall. Another Zimbabwean farmer, Fungisai Masanga (44) saved 150 dollars in labour in the last season after adopting conservation agriculture, another approach of climate smart agriculture. She intercropped maize with nitrogen fixing cowpeas, pigeon pea and lablab. Zimbabwe has a national investment framework which has recognized CA as a sustainable agriculture intervention and as a tool in climate change adaptation. Promoters of conservation agriculture laud it for saving soil moisture, enabling farmers to plant crops earlier and produce more yield and income in 2-5 cropping seasons. However, mass adoption of these production changing innovations is not happening across Southern Africa, much to the chagrin of scientists. One reason being the promotion of manual CA systems to farmers, competition for crop residues with livestock, lack of access to appropriate machinery, and increased need for weed control in the first cropping seasons after conversion. Many innovative climate-smart agriculture practices have been developed in Africa with the capacity to increase productivity and build resilience. These are largely unknown and therefore not adopted, the Forum for Agricultural Research in Africa (FARA) found in a 2015 study. Several countries who signed the Paris Agreement in 2015 have included agriculture as both an adaptation and mitigation strategy on climate change in their national development plans and climate-related strategies including the Nationally Determined Contributions (INDCs), National Adaptation Plans (NAPs) and Nationally Appropriate Mitigation Actions (NAMAs). The United Nations recently agreed to discuss issues related to agriculture, paving the way for the promotion of CSA approaches such as heat adapted crops and weather index insurance for crops and inputs. This actually means that if one has policy that supports climate smart technologies then one needs to tackle a wide range of policy issues, says Bruce Campbell, director of the CGIAR Research Program on Climate Change, Agriculture and Food Security (CCAFS). Campbell cites improving the regulatory framework for index-based insurance, enhancing the ICT regulations so they can foster the spread of mobile phones and connectivity and enhancing the business operating framework so that private sector can function easily. Food security is an urgent priority but agriculture has been the poor cousin when it comes to investment both in research and innovations compared to other sectors. Campbell predicts a slow process in agriculture investment. Upping agriculture’s game needs money, which the sector does not have. Global costs of adaptation in the agricultural sector have been estimated at 7 billion dollars per year to 12.6 billion per year but only. 2.5 percent of public climate finance goes to agriculture. The majority of the needs for finance will have to be derived from private sources, making it imperative to get markets in agriculture working in Africa, currently a net food importer spending more than 50 billion dollars annually. “Without a conducive policy environment, we cannot achieve much,” argues Oluyede Ajayi, Senior Programme Coordinator of the Technical Centre for Agricultural and Rural Cooperation (CTA), an ACP-EU institution based in The Netherlands, which has just launched a 1.5 million Euro regional project to help more than 150,000 smallholder farmers in Malawi, Zambia and Zimbabwe address the impacts of climate change. Stable and clear CSA policies matter in attracting public investment in public goods such as weather stations, data quality and training, Ajayi says while highlighting the need by researchers and development workers to effectively engage in CSA policies by understanding the political process, and identify policy champions and shapers that could help in policy engagement. The challenge to science and policy makers is how to bring the science/policy nexus and to directly bear on accelerating and expanding the evolution, adaptation and uptake of climate smart farming practices, Ibrahim Mayaki, CEO of the New Partnership for Africa’s Development (NEPAD), who gave a keynote address at the 4th Global Science Conference on Climate Smart Agriculture in South Africa last November. According to the Malabo Montpellier Panel – a group of international agriculture experts guiding policy choices on food and nutritional security in Africa – examples and innovations in climate smart agriculture have multiple benefits. For example, agroforestry helps to diversify the produce of farms, improves soil quality and enhances resilience. Solar irrigation enables smallholder farmers to increase their yields without contributing to emissions while the use of stress tolerant seed varieties counter climate change, are more nutritious and are often more pest and disease resistant. Climate Smart Agriculture not smart? The concept of ‘Climate Smart Agriculture’ was originally developed by the FAO and the World Bank, claiming that “triple wins” in agriculture could be achieved in mitigation (reducing greenhouse gas emissions), adaptation (supporting crops to grow in changing climate conditions), and increasing crop yields. The FAO views CSA as an approach for developing agricultural strategies for food security under climate change. But the global civil society organization, ActionAid, says there is confusion on the meaning and benefits of climate smart agriculture. A number of industrialised countries (the US in particular), along with a number of agribusiness corporations, are now the most enthusiastic promoters of the concept, ActionAid says. “But increasingly civil society and farmer organisations express concerns that the term can be used to green-wash industrial agricultural practices that will harm future food production, said ActionAid in briefing. ActionAid contends that some governments and NGOs also worry that pressure to adopt Climate Smart Agriculture will translate into obligations for developing countries’ food systems to take on an unfair mitigation burden. They point out that their agricultural systems have contributed the least to the problem, but that mitigation obligations could limit their ability to effectively adapt to the climate challenges ahead. “Ultimately, there are no means to ensure that ‘Climate Smart Agriculture’ is actually smart for the climate, for agriculture, or for farmers,” says ActionAid. While there is debate on the benefits and constraints of climate smart agriculture technologies, its techniques such as conservation agriculture have improved the productivity for farmers like Zvomarima.